1) If the shoes you found are not black, purple, or burgundy, get out a spray can of black paint or a brush and black acrylic paint and cover the entire surface of the shoe, heel and tongue. If the toes lay too flat, curl them upward while the paint is drying (you can do this by using a weight or clamp). 2) Once shoes are dry, place Styrofoam so it sits snugly into shoes and add ribbon and/or Halloween shoe strings so they tighten the boots around the foam. 3) Using the Low Temp glue gun, secure the moss to the top of the foam. Tip: Using a High-Temp glue gun will melt foam. 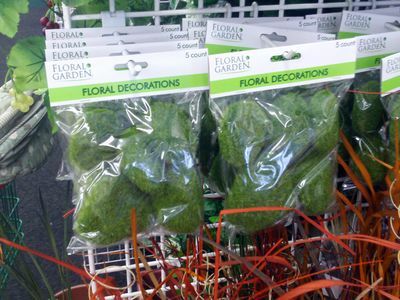 4) Push the silk flower sprigs into the moss/foam. 5) Wrap the same ribbon used with shoes around the shaft of the broom. Position your shoes with your broom (or extra brooms) and possibly a witch sign in a visible place. Add outdoor lights such as a spot light or a string of Xmas lights, if you wish to have it visible at night. To transform any pair of lace-up boots or shoes into toe-curling footwear, you can always take some heavy-duty aluminum foil, wrap it in a cone shape around the toe ends and then shape the foil to curl around. Cover foil with Duct tape (preferably black or same color as shoe, so you don’t have to paint it as well). 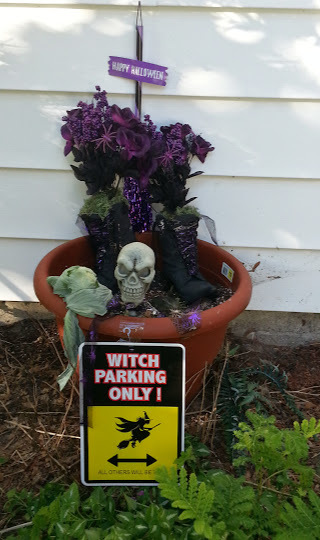 This entry was posted in Uncategorized and tagged classic, DIY, Halloween, Inexpensive, Make Your Own, outdoor decorations, Quick, Witch shoes by thewritegirlforthejob. Bookmark the permalink.